When you are king of the hill, you should be prepared for a lot of sniping from below. That certainly seems to be the case for Amazon, which for the past several years has been under quite a bit of scrutiny and criticism over labor conditions in its fulfillment centers. Amazon's prominence simply throws into sharp relief that simple fact that distribution center jobs are not very good ones, whether that's at Amazon or most anyplace else. In the US, that included stories about FC workers supposedly keeling over by the dozens due to excessive heat in a facility near Allentown, PA (see Amazon.com in Hot Corner after Reports of Sweltering DCs, "Urgently" Buys $2.4 Million in Air Conditioners). There was also an undercover story, where reporter Mac McClelland from Mother Jones magazine got herself a job at what appears to be an Amazon FC, and wrote critically about the experience, in a piece titled "I was a Warehouse Wage Slave." (See Undercover DC Worker Says Job Amounts to Being a "Warehouse Wage Slave"). A book titled "Hired: Six Months Undercover in Low Wage Britain" was especially hard on Amazon. "Amazon was the worst employer, easily," UK author James Bloodworth told reporter Nina Shapiro of the Seattle Times in Amazon's home town, relative to the other low wages jobs he took at a call center, as an Uber driver, as a construction worker, and as a home aide caring for the elderly. Amazon denied the allegations in the book relative to work conditions, adding that "We are committed to treating every one of our associates (the term Amazon uses for its warehouse workers) with dignity and respect. We don't recognize these allegations as an accurate portrayal of activities in our buildings. Amazon may need to hire some Ambassadors down under. An article last week in The Sydney Morning Herald claimed that Amazon FCs are a "hellscape," where "workers face insecurity and crushing targets." This after Amazon really just started direct operations in Australia at the end of 2017. The paper notes critically that the FC workers aren't employed by Amazon directly, but rather sourced through temp firm Adecco. 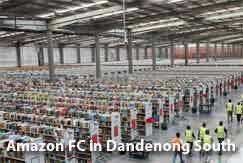 The paper reports that "Labor hire is commonly used in the warehousing industry, but National Union of Workers national secretary Tim Kennedy says it is "unprecedented" for the arrangement to make up 100% of a workplace, which workers say is effectively the case at Amazon's facility in Dandenong South, with only a handful of senior managers employed as staff." Also getting shots is Amazon CEO Jeff Bezos, with comments relative to his place as the world's richest man versus the allegedly lousy pay and work conditions in the company's FCs – a critique coming into the conversation in the US recently as well. "I've never worked anywhere as harsh, and it's frustrating because the head of Amazon is the richest man on the planet." The Morning Herald quotes one worker as saying. The paper also says it was told workers "described a cult-like corporate culture at the warehouse, where each day begins with group stretching exercises and workers having to share an ‘Amazon success story.'" The paper takes an especially negative view of performance targets or standards for FC workers. "At the center in Dandenong South, pick rates are handed out to workers once or twice a day, and those falling below benchmark targets have to explain to their managers why," the paper writes. "You notice people just disappear if they don't reach their pick rates," a worker said. "You just have one bad day and you're gone. Everyone works hard anyway but sometimes you have a bad day, and you could lose your job for that." Repeating the criticism from several of the earlier UK media stories, one worker said a colleague advised them not to drink water before or during a shift because going to the toilet outside designated break times would affect their pick rate. Amazon told the paper that the company "set productivity targets objectively, based on previous performance levels achieved by our workforce", and that workers' performance was evaluated over a "long time". Worker who spoke to paper say there is a pool of about 200 workers engaged at the factory in Dandenong, with about three-quarters of those being recent migrants to Australia. SCDigest's Take: Whether Amazon performance targets set too high a bar is unknown. Here in the US at least, Amazon wage rates tend to be at the upper end of the market's range, and the positions include not common benefits such as health care, stock options and tuition reimbursement. But Amazon's prominence simply throws into sharp relief that simple fact that distribution center jobs are not very good ones, whether that's at Amazon or most anyplace else. What do you think of these stories on Amazon FCs? Fair or not fair? . Let us your thoughts at the Feedback section below or the link above to send an email.